With the arrival of St. Patrick's Day, we wanted to share our green-themed workout plus post-workout St. Patrick's Day smoothie to boost that Irish spirit. All equipment used in the workout is green and then for the recipe, we used spinach for the green color and antioxidant boost. Try this workout & post-workout combo and get luck on your side! Try this full body workout using five pieces of equipment: a 20 lb. medicine ball, jump rope, resistance band, 10 lb. weights and valslides (you can adjust the weight based on your comfort). This workout was designed by Tiffany and demonstrated by Brian. Start with a 5-minute dynamic warm-up such as: knee hug; toy soldier; squat; alternating front lunge + rotation; seal jacks; cross country ski; high knees; and hand walk. Then perform each circuit 2-3 times with 12-15 repetitions each. End with a march to decrease your heart rate and a 5-minute static stretch. Then, enjoy the delicious smoothie for a post-workout snack! 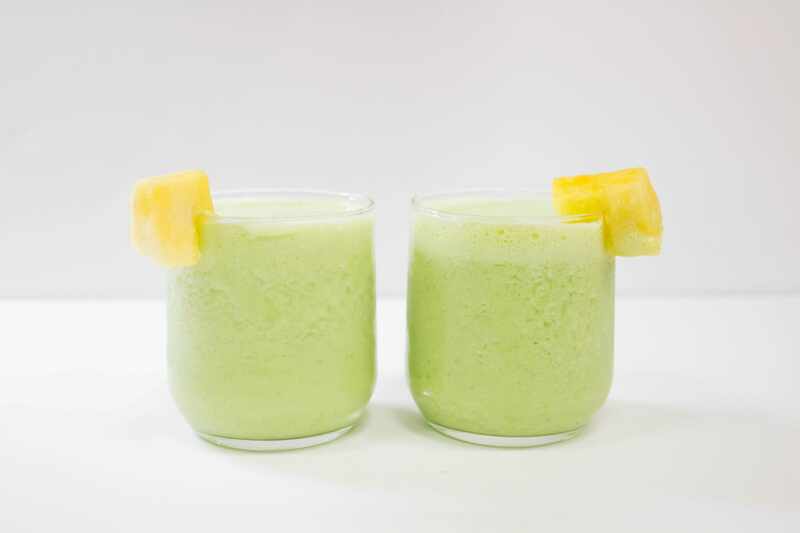 Combine ingredients in a blender, puree, and then pour into a glass and enjoy!